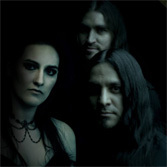 Begun in Texas by guitarist and keyboard player Damien Villarreal, but now working out Minnesota, is Heliosaga, a female-fronted melodic and symphonic power metal. At the microphone is Chelsea Knaack, a classically trained singer who studied under talented vocalist Diana Grasselli. Towers in the Distance is their debut album. A quick overview of the member's biographies and you'll discover their common interest in symphonic, gothic, and melodic power metal, with or without female vocals, from Nightwish to Kamelot, Angra to Sonata Arctica, Epica to After Forever. It's probably best, with Knaack's operatic voice, to put them closer to Nightwish. There musical canvas is large, not so much beginning with Ms. Knaack's voice, but rather the strong brush strokes of riffs and symphonic synths, emboldened by a deep rhythm section. By not saying the vocal arrangements come first is not to say they aren't prominent. They are, but only in the sense that Knaack sounds nearly monotone and unenthusiastic across this album. She has some versatility and range, no doubt, as an opera singer. But that's all she sounds like on this album, that lilting to soaring operatic Tarja-type singer. Which also means, without lyrics, you can't understand her in the least. And even with lyrics, your mind and ears need to work attentively to discern the lyrics. Nevertheless, put her voice together with the music and you have some grand, bombastic, and sweeping material, not the last of which come with A Tower So Tall, Hideaway, and the rather intense and heavy To Heal All Wounds. Conversely, even with their simple intention of delivering European symphonic power metal and the skillful execution of it, there's nothing terribly unique or different about Heliosaga's approach or sound. They simply sound like most everybody else in Europe, or elsewhere, fighting for attention in the genre. The take away, and positive thing, is that those who love this style are appreciative of and loyal to these bands. And if you're that fan, you should definitely consider this album. Even with obvious similarities, Heliosaga will find an audience in and, quite possibly, make their way to Europe, if not support one of those European bands on tour here in the States. Towers in the Distance is an solid and interesting start but, considering the competition, Heliosaga will need something more to put them over the top. 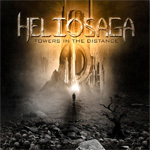 Towers in the Distance, for traditional female fronted symphonic power metal, is an solid and interesting start but, considering the competition, Heliosaga will need something more to put them over the top.